The Commercial Awareness Evaluation is designed to diagnose commercial awareness to deliver ‘value’ beyond traditional economic measures of value, such as price savings. The pursuit of value for money in procurement is hampered by the lack of a clear framework to define what is value? We may well be able to define what it is not, for example accepting the lowest priced offer, but we are not always able to define how we may recognise it if we achieved it? Based on your responses to 24 questions, across the 5 categories of commercial awareness, a profile of your capability will be built and recommendations for future development will be made. 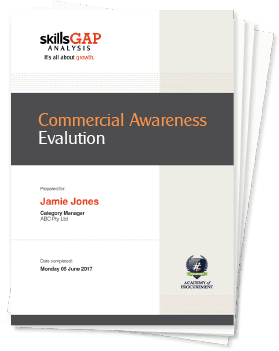 On completion you will receive an individual report with an assessment of your capability across the dimensions of commercial awareness. The report will highlight each dimension focusing on your strengths and your evolving skill-sets. 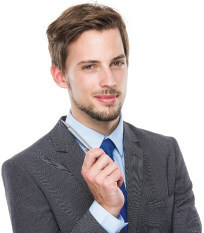 The key output is a set of recommendations for you to consider in light of the case-study scenario evaluation completed. As you work through the assessment you may find themes that are not directly relevant to your current role. This is likely to happen for many people as this diagnostic considers a broad range of Commercial Awareness capabilities. It has purposefully been designed not to be role specific, and is focussed upon organisation’s which do not aim to make a profit, or which have adopted a broader suite of objectives than simple economic measures of success. Value for these organisations is defined in terms that are not simply measured in terms of dollars earned or in terms of customer satisfaction results. While most services are delivered in co-operation with other entities, such as suppliers, managers must be capable of engaging with supply markets in ways that deliver value for the public. With this evaluation there are no incorrect answers!